This week has been busy, but at least now the busy part includes getting to run! I have really been enjoying getting to run and feel more normal again. My speed isn’t there, but just getting to feel the sense of pushing myself again is amazing. Today officially marks 12 weeks of training to Chicago Marathon!! My plan officially starts with a cross training day. This weekend Rob and I got suits to try out swimming laps at our gym pool. 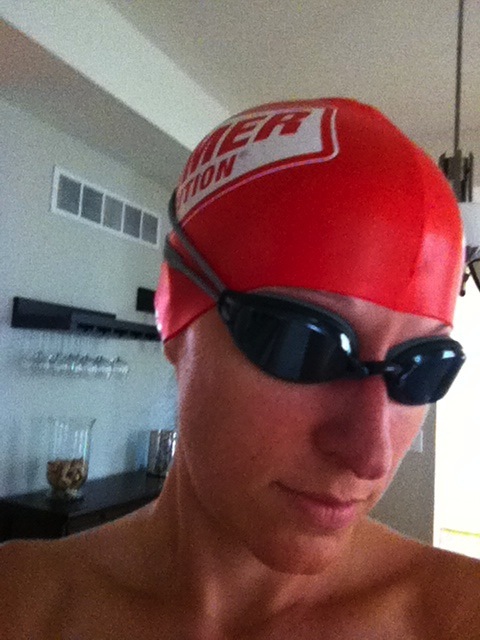 We also got Hammer swim caps and Speedo goggles. I took a blurry picture of me in them before we packed everything up to head to the pool. We were trying to get private swim lessons from our gym to help with basic form, but we never heard anything back. A couple of our friends have offered to help us out, but Rob and I decided to get the embarrassment of being super new out of the way in private. If we didn’t drown then we may take our friends up on getting some pointers. Thanks to Total Immersion Freestyle Swimming youtube videos we had a lot of information before jumping in. We also wore our Garmin 910XTs to try out the indoor swim feature. I had no idea how that would work, but it was super easy. Just change the mode of the watch to ‘swim’ then ‘pool swim’ and select the distance of the pool, which was 25 yd. Note: If you have the Garmin 910XT, make sure your firmware is up to date. They had a major update that fixed bugs and smoothed out the accuracy of the satellite signal. We then worked on the intro drills one quarter to half-way down the pool and then would actually try swimming using the TI form. It was slow going, but that was best for us being new. In a matter of 13 minutes we had finished 500 yd and called it a day before trying to do too much at once. I really enjoyed being in the water and am excited to go back more often. It was so enjoyable it didn’t feel like working out, probably because we also because we took it easy. I know that I will never be a super fast swimmer, but it’s fun to try it out and have the ability to mix up my workouts with something different.